A tile’s metadata subdirectory contains a product template file in .yml format. The product template file specifies how the tile interface collects configurable properties from the user, and how Ops Manager incorporates these properties into its deployment manifest. You can modify your tile’s product template in many different ways. Two important concepts to understand are what the product template contains and how to modify it to include different properties. This topic explains these two concepts and gives examples of different configuration options for tiles. For the purpose of explanation, examples that refer to the product template use the PCF example tile, a functional tile provided by the Ops Manager engineering team that deploys the NGINX web server. For more information about product template configuration, see Top-Level Properties. 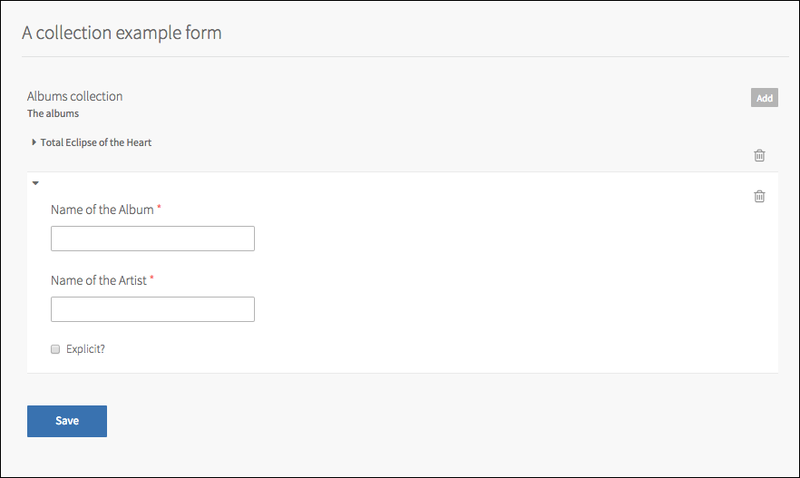 To learn how to configure your tile’s forms, see Form Properties. You can modify the product template to designate property values. 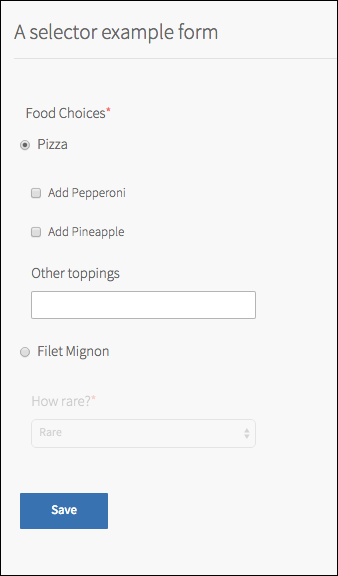 form_types: This defines the tile interface, or how users of your tile view and interact with different tile features. job_types: This defines the jobs that the manifest deploys, or what the tile does in response to user input, developer input, or at set intervals. You can use special expressions in these snippets to include property values that the tile would otherwise not know about, such as user provided configurable properties or dynamically generated system properties. Double-parentheses expressions, such as (( PROPERTY-VALUE )) designate property values that Ops Manager fills in when it generates the deployment manifest. This occurs after the user clicks Apply Changes. These values include configurable properties and properties supplied by Ops Manager. Triple-parentheses expressions, such as ((( PROPERTY-VALUE ))) designate property values that BOSH supplies when it deploys instances of the tile service. For example, CredHub credentials are designated in triple parentheses. When Ops Manager parses a product template and BOSH parses a manifest, they both fill in properties designated by double-parens syntax. 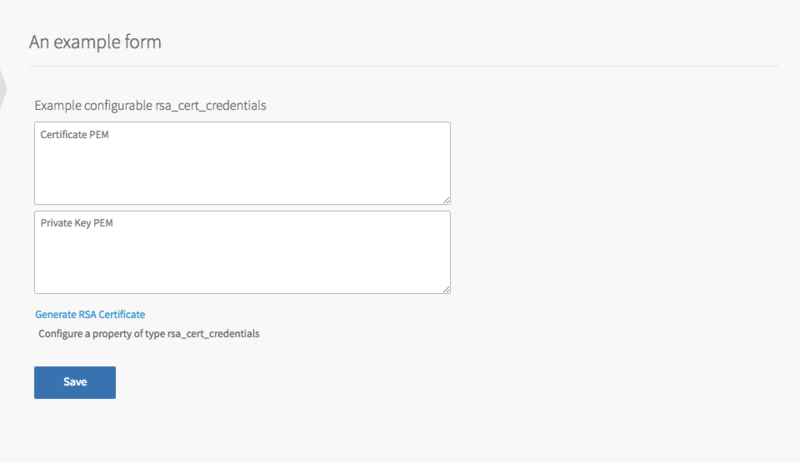 Some property values in a product template, such as CredHub credentials, must be filled in by BOSH on the BOSH Director VM, rather than by Ops Manager. Ops Manager strips the outer parentheses from these expressions and includes the resulting double-parens expressions in the manifest it generates, for BOSH to evaluate at deploy time. For more information about product properties, continue reading Referencing Properties. The information from the property you want to access, commonly known as accessors. For more information about the available properties and their accessors, see the Property Blueprint Reference. Outside of properties, you can also retrieve information about various configuration details of your product and Ops Manager. $ops_manager: Any product can use this to obtain information about specific OpsManagers. $director: Any product can use this to obtain information about the Director. $runtime: Any product can use this to obtain information about the PAS tile. $self: Your own product uses this to obtain information about its configuration. system_domain Provides domain for system-level PCF components, such as the API, UAA, or Apps Manager. Most properties are simple values such as strings, integers, URL addresses, or IP addresses. Others are complex, such as selectors or collections. Selectors: Give the user a choice of a set of inputs. Collections: Give the user the ability to enter an array of values to create a hash. The selector and collections inputs are referenced by their selector and collection property blueprints. Most properties are simple values such as strings, integers, URL addresses, or IP addresses. Selectors and collections are more complicated than simple properties because they contain manifest snippets, which are further referenced in other manifest snippets. Selectors and collections can exist alone, or nest within each other or within different parts of the manifest. The following is an example of the properties that appear at the top of a product template. Definitions of each property follow this example. The internal name of the product. You must keep the name of your product consistent for migrations to function properly. Changing the name indicates the installation of a completely different product. The version of the product. You can only import this version into Ops Manager once. If you want to import the same product or version, you must delete the existing one from the /metadata folder and delete the installation files from Ops Manager’s disk. The version number is important for migrations. The version of the schema of the product template, the file that this documentation describes. Bumping the version number enables new properties that are not present in an older metadata_version but may also require restructuring of the product template to conform to the new metadata_version. The metadata_version corresponds to a major and/or minor release of Ops Manager. Ops Manager can accept a product with a metadata_version that is older than the Ops Manager version, but Ops Manager cannot accept a product with a metadata_version that is newer than the Ops Manager version. It is therefore best practice to set the metadata_version to be the same as the oldest version of Ops Manager that the tile version supports. The label that appears in the product tile when it displays in the Ops Manager Dashboard. The order in which a product tile appears on the dashboard. The BOSH Director always appears at rank 100. For your product to appear to the right of BOSH Director, you must set this value to an integer less than 100. Pivotal recommends that you set it to 1. If all tiles have the same rank, Ops Manager sorts them alphabetically. This regular expression allows Ops Manager’s Pivotal Network integration to pull a specific product file. You must do this when there are multiple products with the same product slug. Requires the operator to select a service network during tile configuration. Tile authors can reference the selected service network with (( $self.service_network )). Includes a UAA client for the service to use. Tile authors can reference the UAA client credentials with (( $self.uaa_client_name )) and (( $self.uaa_client_secret )). enable_patch_security_updates allows you to automatically use the latest patched version of a stemcell. This is set to true by default. For products using static compilations, you can disable this feature. This feature increases security by automatically using the latest patched version of a stemcell. However, operators may experience longer than expected upgrade times. enable_patch_security_updates enables you to automatically use the latest patched version of a stemcell. This key is set to true by default. For products using static compilations, you can disable this feature. This feature increases security by automatically using the latest patched version of a stemcell. However, operators might experience longer than expected upgrade times. Pivotal recommends setting this property to true. If you set the property to false, your product does not receive security patches through automatic stemcell updates. You do not specify which IaaS the Stemcell targets. This keeps your product template IaaS agnostic so that one product template can be deployed on any IaaS. For a list of stemcells, including OS and version, see the BOSH hub. For more information, see Floating Stemcells. A list of stemcell criteria that can be selected using the stemcell_selector property type. These stemcells are listed in additional to the stemcell configure with stemcell_criteria. After an operator has selected a stemcell, it becomes required. For more information about the stemcell_selector property type, see stemcell_selector below. A list of product dependencies. If the required product is not present in the PCF installation, Ops Manager lists the needed dependencies and does not install your tile until the dependencies are satisfied. The list of releases contained in your product’s releases directory. The version of the release must be exactly the same as the version contained in the release (BOSH releases are versioned and signed by BOSH). A list of variables, that are generated after a deploy succeeds. You can reference variables in a manifest snippet using triple-parentheses expressions. A list of errands that run after a deploy succeeds. Set the run_post_deploy_errand_default: property to on or off to set the default for the errand’s run rule selector in Ops Manager. See Lifecycle Errands. If this property is not supplied, the selector defaults to On. A list of errands that run before a deployment is deleted. Set the run_pre_delete_errand_default: property to on or off to set the default for the errand’s run rule selector in Ops Manager. If you do not specify this property, the selector defaults to On. For more information, see Lifecycle Errands. These are keys that define global deployment configurations. For more information, see Managing Runtime Configs. Install-time verifiers confirm that properties for external services are set correctly. For example, the MysqlDatabaseVerifier checks that MySQL database properties are valid by using the properties to connect to the MySQL database. Install-time verifiers run in Ops Manager before changes are applied. name: The type of verifier. The value must be one of the verifiers listed below. properties: The properties to verify. The required properties for each verifier are listed below. ignorable: If this key is set to false, an operator cannot Apply Changes until the verification errors are resolved and an error is displayed. If this key is set to true, an operator can Apply Changes if they choose to ignore the displayed warning. This key is set to false by default. This is the icon that displays on the tile in the Ops Manager Installation Dashboard. A publicly available URL that is passed to BOSH in order to download your releases during installation. If you use this field, BOSH Director must have internet connectivity. This allows you to package your tile without releases, decreasing the tile size. Each form type you write is composed of form properties. 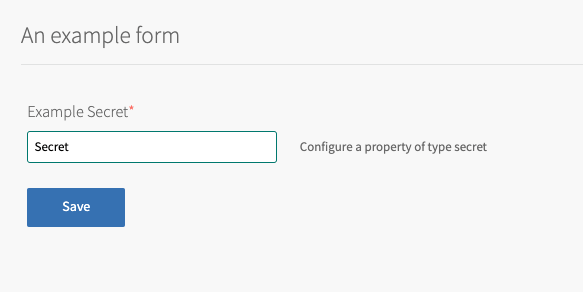 Form properties dictate the structure of the form fields that appear in the Ops Manager UI. The name of each form appears on the left-hand side as navigational tabs. Form properties reference property_blueprints. Property blueprints define each field’s data type. For a corresponding example to the form_types example below, see property_blueprints. description: All the properties that you can configure! ## I am markdown, hear me _roar_. The internal name of the form. The label of the form as it appears as a link on the left hand side of each form. The description of the form. Appears at the top of the form as a header. Provide a block of markdown to display at the top of the form, including image support. Use this property to document the tile and provide explanations or references. References to properties defined in the property_blueprints section of the product template. Verifiers confirm that properties are set correctly in forms. If a verifier displays a warning, the form can still be saved and the warning can be ignored. Verifiers are similar to install-time verifiers except that they run after a form is saved and not before Apply Changes. If you want to have a verifier run when a form is saved and before Apply Changes, add the verifier to both the verifiers and install_time_verifiers sections. For information about how verifiers are configured, see install_time_verifiers. Specify placeholder text for a field. The text appears in light gray to show an example value for the user. The text disappears when the user types in the field and reappears if the user leaves the field empty. The following is an example of the job_types section that appears in a product template. This section defines the jobs that end up in a BOSH manifest. Those jobs are defined in your BOSH release. Jobs require many different settings in order to function properly. That is the core of what Ops Manager does for you: Ops Manager asks a user to designate values for those settings and generates a manifest based on what the user specifies. Ops Manager does not require tile authors to provide vm_credentials in the property_blueprints for each job_type. This is because vm_credentials are generated automatically. You can find them in the release manifest. Note: Ops Manager ignores static_ip and dynamic_ip keys. To configure the static IPs of a job_type, create a property blueprint with name: static_ips and type: ip_ranges. static_ips is a special keyword that Ops Manager uses to find static IPs and pass them to the BOSH manifest. For more information about ip_ranges, see ip_ranges. The name of the job as it will be created in the Ops Manager generated BOSH manifest. The label of the job as it will appear in the resources page of the tile. This is a BOSH feature (creating jobs from different releases). See the BOSH documentation for more information. The name of the BOSH release contained in your product archive, which is the .pivotal file. You can give users control of balancing jobs across availability zones (AZs) by setting single_az_only to false. To limit a job to a single AZ, set single_az_only to true. WARNING: If you change the single_az_only setting, your VMs may switch AZs. This change can cause an orphaned disk. 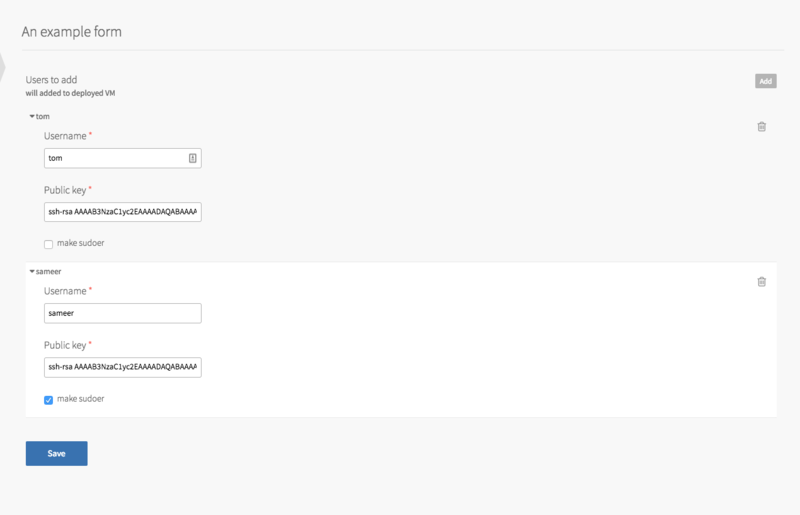 A BOSH setting that controls the number of instances of this job that BOSH will deploy in parallel. A set of resource settings for the job along with maximum and minimum constraints, defaults, and enabled or disabled configurability. For examples of supported constraint types, see integer below. Note: If you set the default property for persistent_disk to 0, users cannot edit this value and the Resource Config page in Ops Manager displays None under the persistent disk field. The number of default instances for a job, including maximum, minimum, odd, and the ability to decrease sizing after deploy. If your product uses an external service that performs the same job as a service in Pivotal Application Service (PAS), you can reduce resource usage by setting the instance count of a job to 0 with the zero_if property. For example, your product uses Amazon Relational Database Service (RDS) instead of MySQL, which is the default system database for PAS. Remove all instance counts of MySQL by setting property reference to .properties.system.database and property value to magic value. Note: If you are using the zero_if property, you should not set the may_only_increase constraint to true. Ops Manager generates a BOSH manifest that defines properties for each job the manifest deploys. Some of these properties are not set until the user clicks Apply Changes, because the user configures them in the tile or because Ops Manager has to generate them. For more information about these properties, see Designating Property Values. The name of the property. The name is used to reference a property in form_types and in (( )) accessors. The type of property. Must be one of the property types listed in this documentation. When set to true, Ops Manager will not require this property to be set in order to deploy, nor will it validate that this field has a value when saving a form with this property. optional cannot be set to true if a default value is set (see documentation below for which types support default). optional cannot be set to true if the property also has configurable: false. When set to true for property types which support operator configuration, the operator will be allowed to configure this value. Do not set configurable: true for property types which do not support operator configuration. When set to false, Ops Manager will not render this property in any form, even if it’s specified in a form_type, nor will it allow the property to be updated via the API. For property types which support auto-generation of values, when configurable is false, Ops Manager will generate and save a value for this property when the product to which this property belongs is deployed for the first time. When set to true, Ops Manager will not allow this property to be changed after the product this property belongs to is successfully deployed. When a property has configurable: true and is added to a form_type, the operator can configure the value of that property. Alternatively, a property with configurable: false will have a value auto-generated by Ops Manager. See below for which property types support each of these usages. + cannot be edited by the operator. 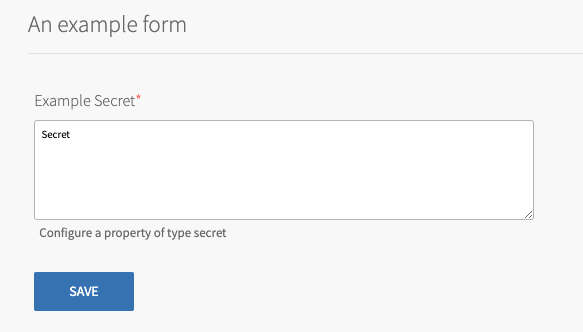 + will not show up in forms, even if added under `form_types`. + will have auto-generated values filled in by OpsManager if that specific type of property supports auto-generation of values. Specify a property for collection within the named_manifest section of the metadata. Use the current_record property within a collection record to refer to other properties in the same record. For example, the properties in the for_routing named manifest refer to the values for name, private_key, public_key, and certificate within this record only. Note: The current_record property is reserved. You cannot create a new property named current_record. For more information, see the sections on Selector and Collection types. Below is a reference to every property blueprint type. This holds a single boolean value. default Optional. Specifies a default value. When provided, must be set to a value which is valid for this type. Cannot be used when the property also has optional: true. value Returns the boolean value of the property. value_present? Returns true only if the value of the property is set. value Returns a string or null. This holds multiple records of a group of custom defined properties. property_blueprints A group of property blueprints that each record will have. Any type and combination of property types can be used except collections and selectors which cannot be nested inside of collections. named_manifests An array of objects each containing a name and a manifest. The manifest specifies the YAML which can be used with parsed_manifest(name) where the manifest will be interpolated for each record in the collection. The manifest has a special property level, current_record, which has all the properties in a record of the collection. The provided example below shows have named_manifest, current_record, and parsed_manifest together to render a collection in a BOSH manifest. parsed_manifest(named) An array of interpolated YAML elements (often objects, but could be strings or numbers). Where each element of the array is an interpolation of the named_manifest for each record. This holds a single string value selected from allowed disk types. resource_definitions Optional. An array of objects with the same schema as resource_definitions for job_types. For disk_type_dropdown, resource_definitions should only have one element with name “persistent_disk”. This element can also specify a default which OpsManager uses as a minimum bound when it selects a default value. It can also specify constraints, which can be any set of constraints that can be specified for an integer property. For examples of supported constraint types, see integer below. value Returns a string containing the size of the selected disk in megabytes, e.g. “1024”. If nothing or “Automatic” was specified by the operator, then then this returns the smallest disk that is greater than the default value specified in resource_definitions. If no default was specified, then this returns the smallest disk in the catalog. value_present? Returns true only if a disk type is selected. If the user has selected “Automatic”, value_present? will be false. text: "Hello user, I see that your favorite disk size greater than 2 Gb is: (( .properties.example_disk_type_dropdown.value ))." This holds a string value that is a valid domain (e.g. example.com or x.example.com:80/a/b). value Returns the domain as a string or null. value_present? Returns true only if the value is a non-empty string. text: Hello, user. I see your favorite domain is (( .properties.example_domain.value )). This holds an array of strings selected string values. The default value should be one of the options’ names. For example, in the example shown below, “tomato” could be used as the default. options An array of hashes, each item specifying a: name, which becomes the value of the property if this option is selected, and label shows up as the text in the dropdown for this option. value Returns the name of the selected option. value_present? Returns true if an option in selected, and that option’s name is a non-empty string. text: Hello, user. I see your favorite fruit is (( .properties.example_dropdown_select.value )). This ensures the string value is formatted as an email address. value_present? Returns true if value is a non-empty string. text: Hello, user. Your email is (( .properties.example_email.value )). This holds an HTTP URL. text: Hello, user. For fun, please visit (( .properties.example_http_url.value )). This holds a single integer value. constraints Constrains which integer values are considered valid. See the below table for all supported constraint types. max Sets the maximum value of the integer. may_only_be_odd_or_zero Sets the integer to only allow odd or zero values. may_only_increase Sets the integer to only increase in value. min Sets the minimum value of the integer. modulo Sets the integer to only be divisable by the given value. power_of_two Sets the integer to only be a power of two. zero_or_min Sets the minimum value of the integer but allows zero. value Returns an integer or null. value_present? Returns true if value is an integer. Ensures the string value is an IP address. text: Hello, user. I see your favorite IP Address is (( .properties.example_ip_address.value )). This holds a string that is a comma-separated list of IP addresses and IP address ranges. value Returns a string containing a comma-separated list of IP ranges and IP addresses, or null. text: Hello, user. I see your favorite IP ranges are (( .properties.example_ip_ranges.value )). Ensures the inputted string matches a URL of the LDAP protocol. text: Hello, user. I see your favorite LDAP URL is (( .properties.example_ldap_url.value )). This holds an array of selected string values. Must be an array of non-blank strings. value Returns an array of strings for the selected options or null. value_present? Returns true if any of the checkboxes are checked. This holds a string which is a hostname, domain name, or IP addresses. text: Hello, user. I see your favorite network address is (( .properties.example_network_address.value )). This holds a string which is a comma-separated list of hostnames and IP addresses. value Returns a string which is a comma-separated list of hostnames and IP addresses or null. text: Hello, user. I see your favorite network addresses are (( .properties.example_network_address_list.value )). This holds a single integer value. Allowed values are 0 through 65535 and null. value_present? Returns true if value is not null. text: Hello, user. I see your favorite network port is (( .properties.example_port.value )). default For properties which use configurable: false, the default can specify a list of domain names to use when auto-generating the RSA certificate. The first domain listed will be the value of the Common Name field of the cert. The full list of domains will be the value of the Alternative Names field of the cert. See below for an example. value_present? Returns true if value is an RSA certificate. Returns false if the value is null. This holds RSA public and private keys. This is a non-configurable property. value_present? Returns true if value of the pkey already exists. This holds credentials with salted and hashed passwords. This is a non-configurable property. This holds a single string value for a secret. Adding display_type: text_area to the property inputs creates a multi-line credential. constraints.must_match_regex A regular expression that the user input must match. 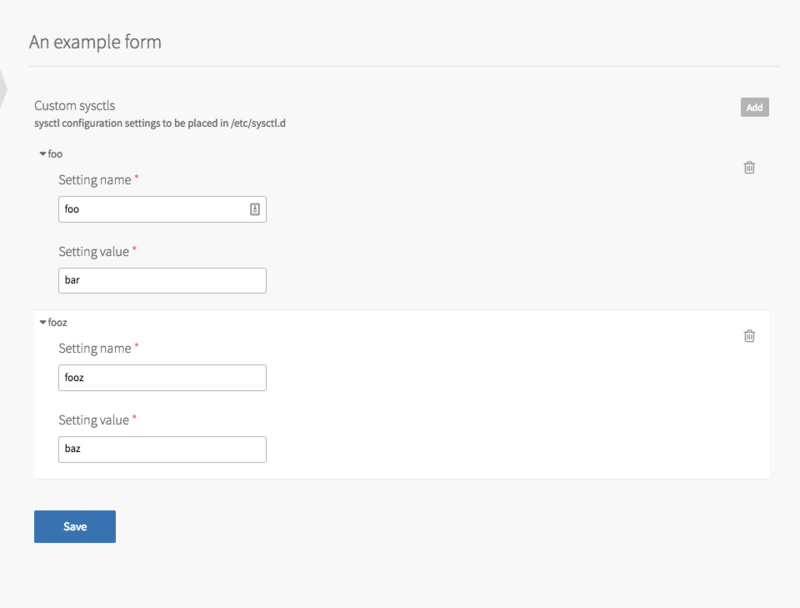 Create a validator that runs on the form save event. If the user input does not match the must_match_regex constraint, the form displays the specified error_message. Multiple must_match_regex constraints for a single property blueprint are evaluated in the order listed. See below for an example. value Returns the secret as a string or null. text: Shh, today's secret is (( .properties.example_secret.value )). Provides the ability to switch between groups of properties. Shows in the UI as a radio button group, potentially with additional options nested under each radio button. Selectors are unique in the way that property information is accessed. Ops Manager provides accessors available at the top-level selector property, accessors for retrieving a specific property in an option group, and the ability to provide manifest snippets for a selector option group. Each selector group may provide manifest snippets. This is because Ops Manager does not support conditionally adding manifest snippets. A manifest snippet should be present within all option groups, and can be used to create a simple kind of branching logic in manifest generation. Only one of these sets is evaluated and inserted into the job’s manifest. If specified, the default value should be one of the values of select_value. option_templates An array of objects which defines the options available. See example below. value Returns the select_value string of the currently selected option group. For example, the selector shown in the example below might return “Filet Mignon” as its value. selected_option.parsed_manifest(manifest_snippet_name) Returns a parsed named manifest snippet for the currently selected option. SPECIFIC_SELECTOR_OPTION_GROUP.OPTION_GROUP_PROPERTY.value Scopes the accessor to a specific selector option group. Does not return meaningful information alone. Must be followed with the name and accessor of a specific property in the option group. value Returns the select_value of the selected option. Would you like some (( .properties.example_selector.value ))? This holds an arrays of string value selected from allowed availability zones (AZs). value Returns an array of strings for the selected options. value_present? Returns true if value is set. text: "Hello, user. Here is an array of AZ names: (( .properties.service_instance_azs.value ))"
This holds a single string value selected from allowed azs. Appears as a radio button group in the UI. text: "Hello, user. Here is a single AZ name: (( .properties.example_service_network_az_single_select.value ))"
This holds an identity and password. This holds string with a possible value of plain, login, or cram_md5. value Returns a string with possible value of plain, login, cram_md5. This holds an array of strings. This holds a single string value. value Returns the string value or null. text: Hello, (( .properties.example_string.value ))! Welcome. This holds a string value. For configurable properties of this type, the UI allows multi-line strings to be entered. Hello. Check out all this text! This holds a string uuid value. This holds single string value selected from allowed vm_types. resource_definitions Optional. An array of objects with the same schema as resource_definitions for job_types. For vm_type_dropdown, resource_definitions can have elements with name “ram”, “cpu”, or “ephemeral_disk”. This element can also specify a default which OpsManager uses as a minimum bound when it selects a default value. It can also specify constraints, which can be any set of constraints that can be specified for an integer property.For examples of supported constraint types, see integer above. See example above. value Returns a string which is the name of the selected VM type. text: Hello. Your chosen VM Type is (( .properties.example_vm_type_dropdown.value )). Ensures the string value is a domain prefixed with *..
text: Hello. Your wildcard domain is (( .properties.example_wildcard_domain.value )). You can copy each example into the metadata.yml template below and package it together along with the os-conf release as a .pivotal file to make a working tile. includes: # This top-level key will be ignored by OpsManager. # This anchor is only to make the examples below more terse, and is not required.